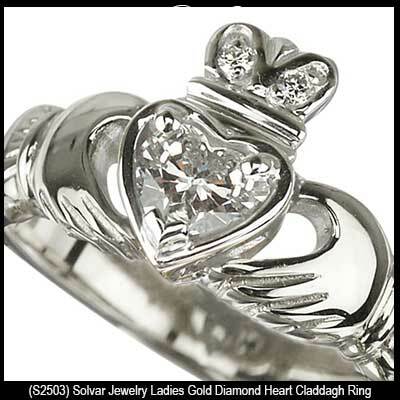 This 18K white goldCladdagh engagement ring features a 1/4 carat (0.25ct) heart shape diamond with additional diamond accents in the crown for a 0.28ct total diamond weight. 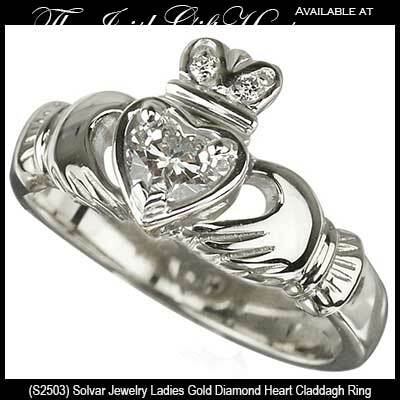 The diamonds on this gold Claddagh ring have a clarity of SI 1 and a color of G - H. The diamond Claddagh ring measures 3/8" tall from the bottom of the heart to the top of the crown and is gift boxed with a Galway Folklore card that explains how to correctly wear the Irish ring along with a Claddagh legend card, complements of The Irish Gift House. 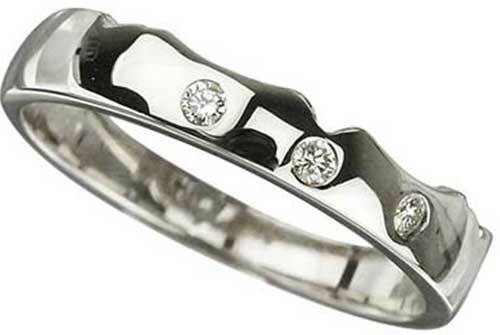 The available matching, S2638, 18K white gold shadow band fits into the Claddagh engagement ring and is sold separately; both rings are made by Solvar Jewelry in Dublin, Ireland.